During a Testing I had to do at my workplace I had to copy files to an input location at a random time so that there would be a constant supply of input files. I did some googling and found out several commands and integrated those together to create a batch file which can do that. The waiting is done using a ping command with a timeout. The timeout is taken from the system environment variable RANDOM so that it pauses for a random amount of time before copying files. After copying files I do a clean up on output files so that the storage is not spiked. COPYCMD Environment Variable is used to Enable overwriting of existing files without prompting. I was having some free time and wanted to put learn Android development. I found a Great Android Application called SL4A (Scripting Layer for Android) which is an intermediate Android app which sits between the Android OS native methods and popular scripting languages such as Shell Script, Python, Perl etc. Things required to build the Prototype. Using the above mentioned equipment I put up the following prototype. The Green LED is driven using Pin 2, The Red LED is driven using Pin 3 and the Servo motor is attached to Pin 9 (Analog Output with PWM). Android phone I have is a Samsung Galaxy ACE with Android OS 2.3.3 Gingerbread. I installed SL4A and Python for Android to enable Python Scripting in Android. The Middle Man in this application is a Java Thread based UDP Server which listens for UDP packets from a connected Android app and Does the Serial communication to the Arduino Microcontroller. 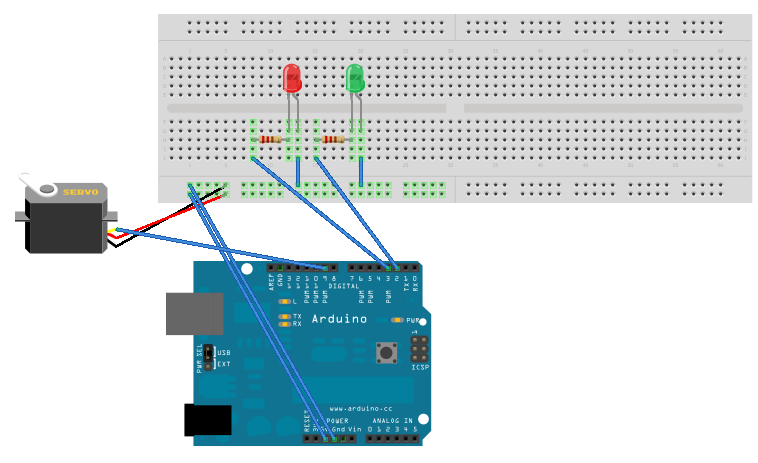 Arduino Serial Communication is done using the RXTX Library for Serial Communication. The video of the System is below. The accuracy completely depends on the way you pronounce the words "open" and "close", Surrounding noise and Google Voice API. In this video as you can see the The "open" word is not recognized first time. But the close word is. I have been quit for sometime in my blog due to some work I had at work place. Got the time to work on Arduino Interrupts today and managed to put a small sketch on Arduino based Interrupts. Interrupts are a really powerful concept in hardware as well as in software. Specially in hardware, Interrupt eliminates polling saving precious processing cycles. An interrupt is a Sporadic event which occurs asynchronously. For instance while reading a socket for data we can either Read that socket Periodically to see whether there is any data to be read or we can attach an ISR (Interrupt Service Routine) for that socket. Whenever there is data available in the socket buffer the ISR will be called asynchronously and the main program will be stopped executing. When the ISR is finished executing the main program will execute from where it stopped. This is called Context Switching. 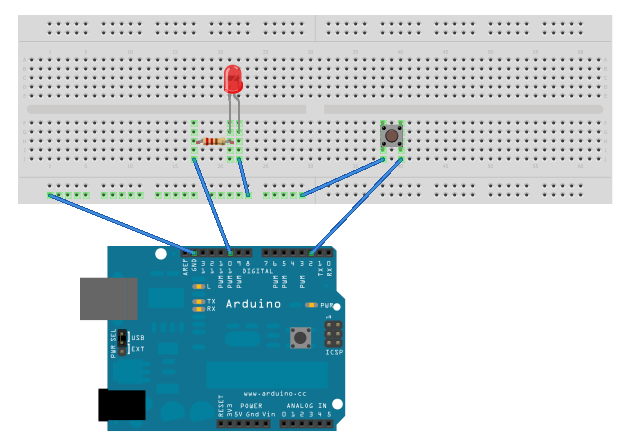 Arduino UNO has two pins for External Interrupt handing INT0 (attached to pin 2) and INT1 (attached to pin 3). What I have tried to accomplish is without periodically reading pin 2 for a High value using Processing Cycles. Whenever there is FALLING (High to Low) in pin 2 a predefined ISR to be called which basically checks the state and does the opposite. The Arduino Sketch for the program is as below. I have used INT0 with pin 2 for interrupt signal. As you can see the loop method doesn't do any polling on the value of pin 2. And I have used pin 10 for LED Output.